Heather Dessinger 54 Comments This post contains affiliate links. 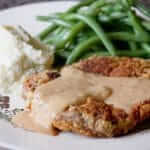 This chicken fried steak recipe is a grain-free version of one of my favorite childhood meals. It’s like a great big southern hug with country-style gravy on top. We love it with mashed potatoes (or cauliflower fauxtatoes), green beans slathered in butter, and a big salad with homemade ranch dressing. Let’s get started, shall we? Mallet TherapyIf you're working with cube steak most of the tenderizing has already been done, but give it a few whacks to thin it out a bit.Round steaks need a bit more work, but they should look something like this when you're done. PrepPlace whisked eggs in a medium bowl. In a separate medium bowl mix together almond flour, coconut flour, salt, onion powder, garlic powder, paprika and pepper. 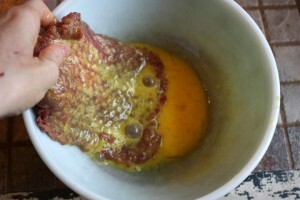 SoakPlace each steak in the bowl of whisked eggs and coat thoroughly. 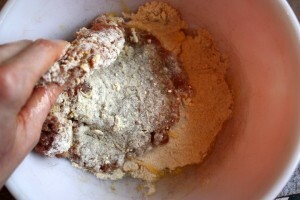 DredgeDredge steaks in the flour mixture.Set aside to rest for 3-5 minutes. While you're waiting go ahead and preheat a non-stick pan with enough oil to generously coat the bottom (use medium heat). FryPlace steaks in pan (if it doesn't sizzle it's not hot enough!) and fry on both sides until golden brown. Top with this creamy dreamy homestyle gravy and enjoy! Haha…we have cube steaks (grass fed 99% naturally lean organic) thawing in the fridge AS WE SPEAK and I will be using your flour/spice blend! I think the recipe I use has me making up a GF DF gravy with beef broth that I pour over the steaks and bake for a looong time. Do your steaks stay crispy? Cuz I like it crispy better. 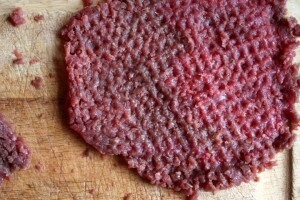 The baking method makes a yummy gravy, but then the coating on the steaks turns soft. 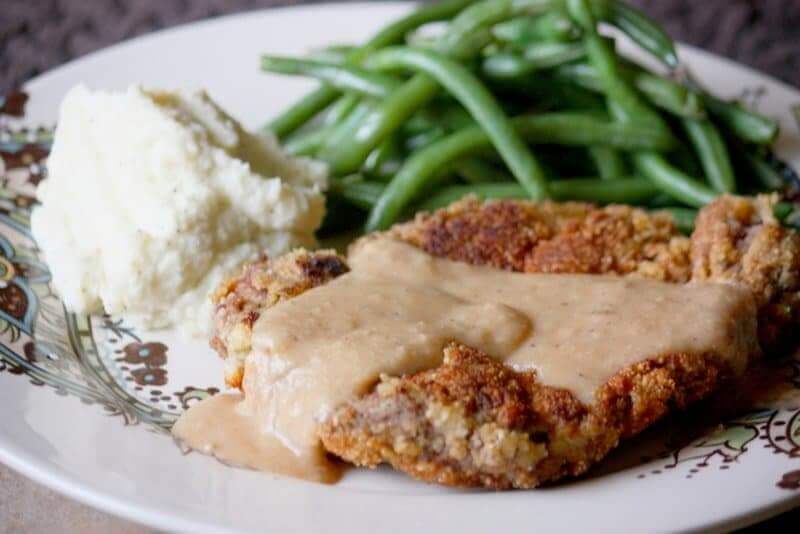 We make grain free chicken fried steaks about once a month. And yes, it turns a grown man into a puppy, he will follow you anywhere-drooling all the way! I do add a dash of cayenne to our “flour blend”. This sounds delicious but the gravy link didn’t work. Sharmista Anthony – Thanks for letting me know. We ran out of the house this morning for house showings and this is the first time I’ve been at my computer since. It’s working now! Let me know how you like if you give it a go, Kathy! I couldn’t find coconut flour is this something you can make by grinding it really fine? You’re welcome, Tiffany! I hope you like it! I’ve used a hammer over a plastic serving spoon in a pinch! I laid the serving spoon over the meat and used the hammer on it…it worked decently! Thanks, Melissa Sapien Aulds, I am going to try that! Crossing my fingers for you!! 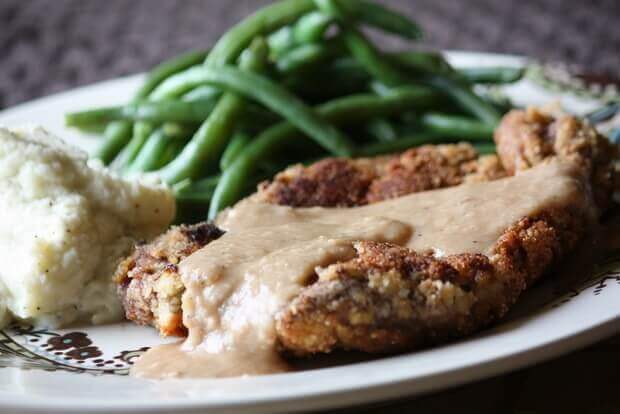 Mmmm, chicken fried steak sounds lovely! Thanks, Nicole Rice! I ended up finding my rolling pin before the hammer, but it’s nice to have options. You never know when you’re going to **need** to make chicken fried steak without traditional supplies, you know?? I’m so sorry that happened, Rena Arnold! Personally, I’ve found that letting the steaks absorb the batter for 5-10 minutes before frying keeps more of it on, but sometimes pieces of it flake off anyway. Also making sure the oil in the pan is nice and hot before throwing one in helps. I wish I could invite you over for a do-over meal! Haha! I would make that drive. I’m pretty sure it’s my technique. It did the same when I made flour CFS several years ago. I will try both waiting and the hotter pan next time. Thx! Do you think I could use ground pecans or hazelnuts instead of almonds? I think the pecans would turn into “butter” rather than flour and I haven’t worked with hazlenuts enough to say, but it may be worth a try! Be careful with the oxalates!! 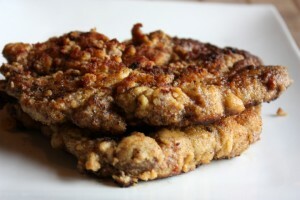 I have “steak cutlets” from our last 1/4 beef order. Does that sound like the same thing? I’d love to put this on the menu next week! OMG…huge hit with my family!!! This was a hit with my family as well. All six of us devoured it! Thanks for the recipe! Yay! So glad you liked it, Stacey! I’m in the process of making this and tried a bit and it is excellent! 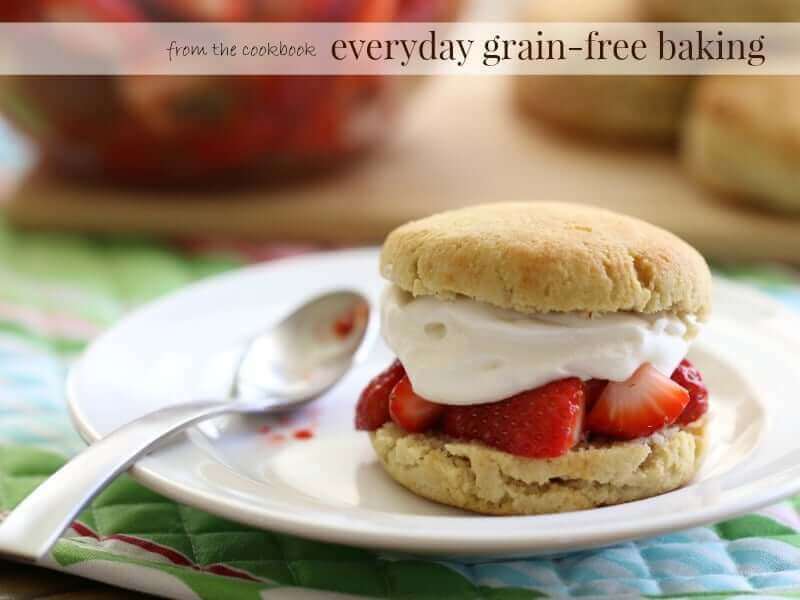 I shouldn’t even tell my husband it is grain free. I may post a picture of my finished project on my blog with a link back to your site. Would that be ok?? So glad you liked it and absolutely! 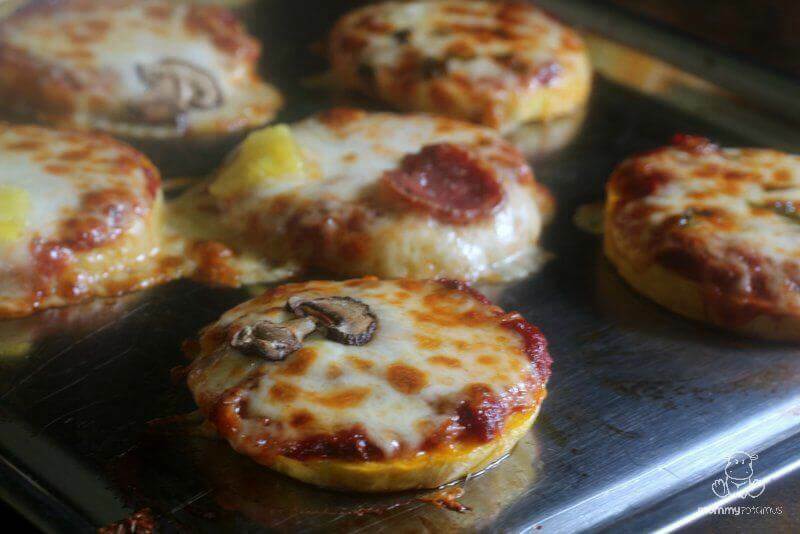 Just please link back here for the recipe rather than reposting – THANK YOU! I made this with chicken last night, because I didn’t have any steak, and it was so so good!!! Everyone ate every last bite! I apologize if someone already asked this, but can you omit the eggs or substitute with something else for those with egg sensitivities? Hi Gail, I have not tried this recipe with an egg substitute so I’m not sure. If you try it please let us know how it works out! We have but allergies in iur house and can’t do almond flour. Any substitutes you suggest? I used ground raw sunflower seeds and it was yummy!!!! My husband, really doesn’t like coconut flour can you just use more almond flour!?? Or do I need to use both!! Thank you looks so good!!! Do you have a link to print this out on one page, just the recipe, not all the advertisements and pictures? YUM! Used ground up pork rinds instead of the flour mixture. 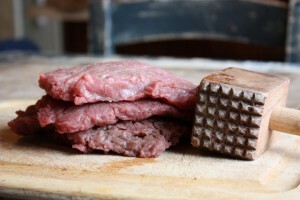 The best solution is have the butcher at any grocer run your preferred cut of meat through their tenderizer once or twice, depending on thickness and toughness.